The new organ stands on a west gallery in the tower arch. It is based on the early work of Bernard Smith, between his last work in Holland, at the Grote Kerk in Edam (1656) and his first work in England, at the King’s Private Chapel in Windsor Castle (1673) of which the front survives at Walton on Thames. 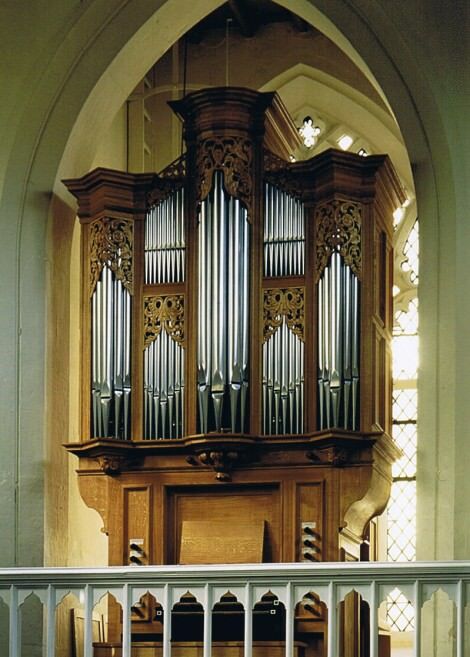 Other elements are taken from the organs at Noordwolde, Eenum (1695) and Adlington Hall (ca1695). The * shows stops also available on the other manual at half-draw. The Prestant is from G in the front with stopped wood basses. All the manual pipes are metal. The pedal pipes are wood. All the wood in the organ is oak. The compass is C – g3 and C – f1. The pitch is a1=440Hz and the tuning is a modified meantone based on Roger North’s instructions. The wind is provided by a 2m x 1m single fold wedge bellows, with a sprung regulator for the Pedal. The wind pressure is 68mm on the manuals and 75mm on the pedals.